You’ve tried to heal yourself, but you feel stuck. You know deep down that you are here for a purpose. You crave a supportive circle of friends that see the real you. Are you ready to open your heart to all the universe has to offer? Imagine having an intimate support team of plants, sisters, and indigenous guides to walk by your side. Imagine truly knowing how to heal yourself. What would it feel like to wake up and know why you came here? Courage 2.0 is more of a sisterhood than a retreat. After leaving our corporate jobs, we needed a reset. We found that, and so much more, on our individual healing journeys in Peru. Working with plant medicines and connecting with the powerful energy of the Sacred Valley is one of the most impactful paths of self-healing one can experience. This retreat will bring you from fear to love in just 7 days. Together we will journey into our depths to reveal our Soul's true essence. Through work with local medicines, we will heal, vision and create a heart-centered path for our lives. The divine feminine is awakening. Everywhere you look, women are stepping into their power as visionary leaders for the future of humanity. In order to create a heart-based society with reverence for nature, it is our duty as women to bring our shadows to light so that we may heal and awaken. 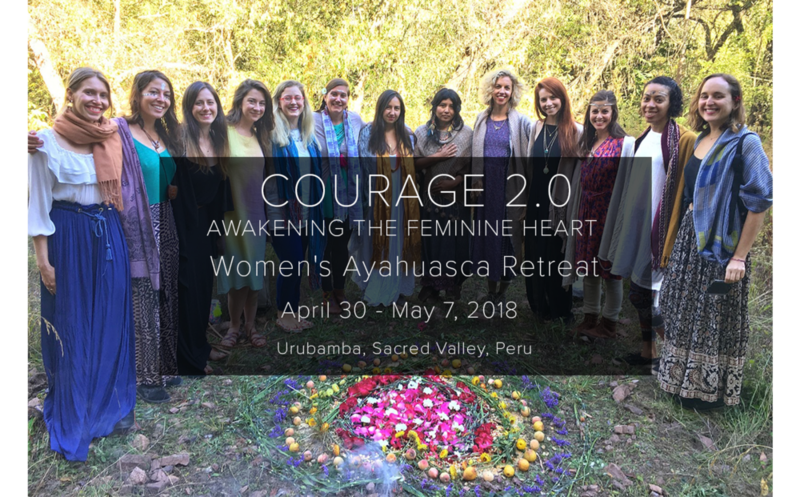 Courage 2.0 is a 7 day women's retreat working with Ayahuasca, Cacao and indigenous wisdom traditions from Peru. These medicines and traditions support our healing and awakening in profound ways. During the retreat, you will have an opportunity to connect with like-minded sisters who are heeding the call of their hearts. Through individual mentorship and group circles, we will return to the Old Ways of healing in community, uplifting one another through struggle and triumph. If you are ready to step into a more expanded, powerful Self than you’ve ever imagined, this retreat is for you. Our sweet Maestra, Juana, and photos from our last retreat in Peru. For the Ayahuasca ceremonies we will be working with Juana, AKA Isa Yaka (Hummingbird). She is 60 years old and comes from the Shipibo community of Pauyan. She has been studying as a maestra for more than 30 years and has dedicated herself to the path of healing through her commitment of many years of dieta. Her main dieta has been with the tree, Noya Rao, which she began dieting 11 years ago. Her lineage of healers are known and respected as some of the most powerful curanderos/as of the Shipibo tradition and of the Amazon region as a whole. Juana is also known for her incredible knowledge of the body and specializes in massage and bone setting. She has 8 children and holds a joyful, child-like spirit. Carolina will work alongside Juana as the facilitator for our Ayahuasca Ceremonies. 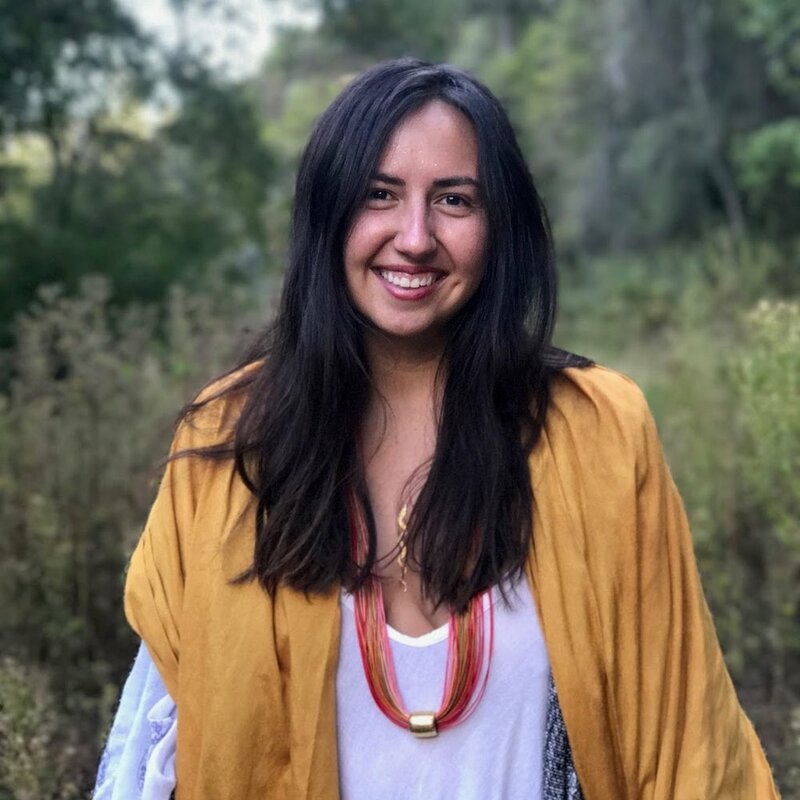 She also hosts her own ceremonies through her organization, Tree of Light Retreats, which holds a safe space for women to experience Ayahuasca in the Shipibo tradition. She lives in the Sacred Valley of Peru with her partner and beautiful daughter. Carolina first began working with Ayahuasca in 2010. After her first ceremony she knew that she had found her teacher, and in 2011 she made her first journey to Peru to work with Shipibo healers. Her experiences were so profound that she decided to make a big life change and move to the jungle. She spent the next few years working closely with the medicine and other plant dietas. She received a very deep calling from the plants to help share their wisdom and support others choosing to step onto this path. Qori Koka (meaning Golden Coca, the sacred plant of the Inca) was born and raised in the Sacred Valley of Peru. She is of Inca descent and carries the wisdom traditions of her ancestors with humility and honor. During Courage 2.0 Qori will lead us in an offering for the land. We’ll lay down our prayers and gratitude at the beginning of the retreat, asking the sacred land to hold us as we journey deep into our hearts. She will also be sharing a water blessing with each woman to cleanse and purify your spirit. It is such an honor to have her at our retreat, sharing the ancient Inca wisdom codes and her reverence for Pachamama. 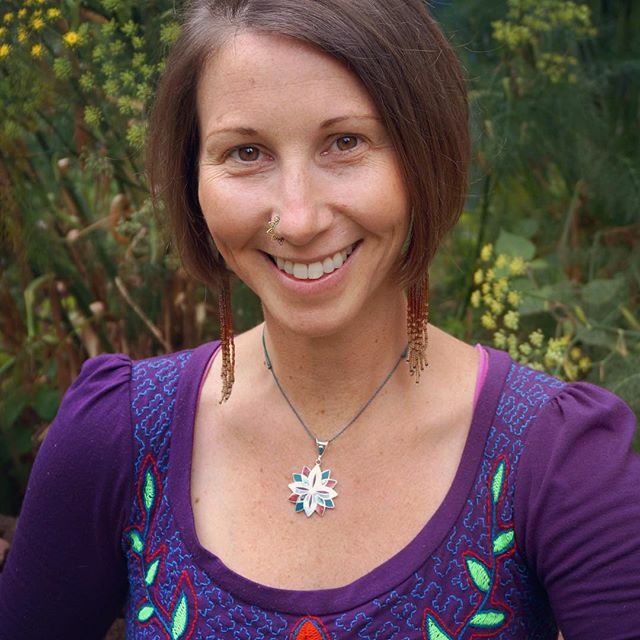 Sena is a Cacao Coach, Transformational Guide, Plant Medicine Educator, and Ceremonialist. She combines her business skills with the wisdom of Plants to help you connect to your truest essence and get clear on what your soul is here to express. After 5 years of working at Google she took a leap of faith, sold all of her things and bought a one-way ticket to Peru. Since then she has traveled and studied in Peru, Costa Rica and Guatemala, shedding old paradigms and learning to love herself along the way. She is now based in Sonoma County, California where she leads ceremonies, 1:1 Cacao Coaching sessions, and runs her online cacao course. Maggie McCloud is a multidimensional guide, Earthkeeper, and plant medicine advocate. 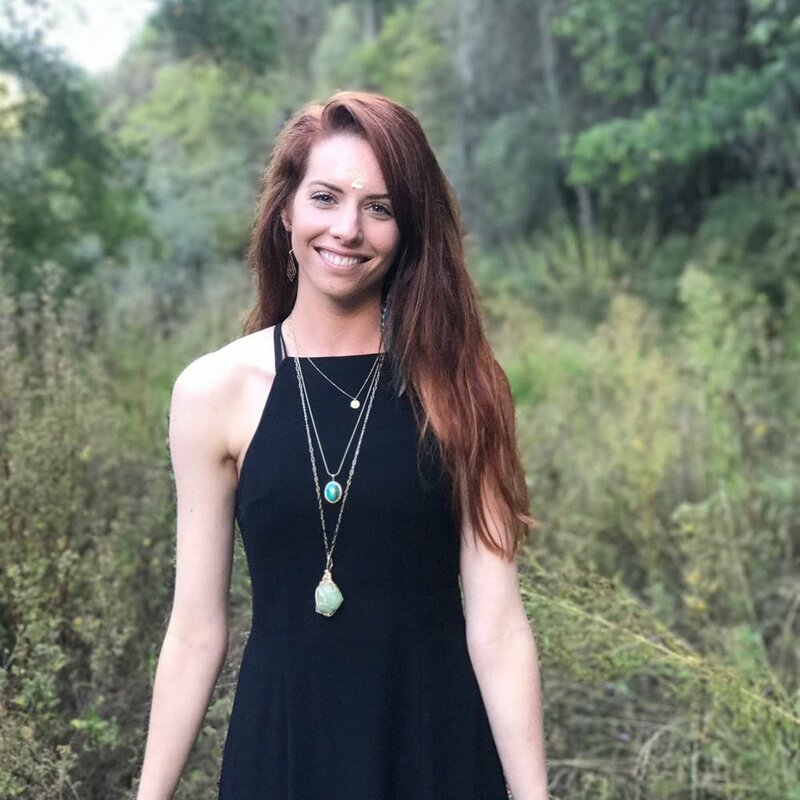 Here in service to the awakening of humanity, her mission is to help people reconnect to their hearts and bring their unique visions to life. Maggie lives a nomadic lifestyle and is currently based in the Green Mountains of Vermont. After working at Google for 5 years, she left to follow her heart’s deepest desire of starting her own business. In addition to being the co-creatress of Tesora Sacred Travel, Maggie teaches an online course for female entrepreneurs called Project Phoenix which fuses her business skills with her shamanic studies. Working with Ayahuasca in Peru changed both of our lives, and we want to make sure that this opportunity is accessible to anyone who feels called to it. We know that the price may seem intimidating for some, which is why we are offering payment plans. Payment plans are 3 payments of $633 paid monthly on the 21st. Your first payment will be made as a deposit when you register by March 31, then you will be billed April 21, and May 21. Unlike other retreats, there is no additional fee for choosing the payment plan option. In addition, we are accepting the final payment after the retreat to make this as flexible as possible. You can access the payment plan option when you click the button below. Las Chullpas is a beautiful eco-lodge situated in Urubamba in the Sacred Valley of Peru. We are offering private, double and triple occupancy rooms for your stay. There is ample outdoor space so that you can connect with nature throughout the retreat. Our meals will all be vegetarian. We recommend that you arrive at least 2 days before the retreat begins so you can acclimatize to the altitude. Cusco is at 11K ft and the Sacred Valley is around 9K ft. You’ll want ample time to rest and allow your body to adjust to life at 2 miles high. Once you register for the retreat, we’ll provide a list of places to stay in Cusco and Pisac that are near our pickup locations for Monday, April 30. We love Las Chullpas because it’s private and secluded, but its off-the-beaten-path location makes it a bit challenging to get to. We will be providing transportation to and from the retreat center to make your journey with us as seamless as possible. The retreat begins on Monday, April 30 in the afternoon. We will have 2 pick-ups - one in Cusco and one in Pisac - to transport you to Las Chullpas, the retreat center. The retreat ends on Monday, May 7 in the morning. We will have 2 shuttles - one to Cusco and one to Pisac - to transport you from Las Chullpas. Both Cusco and Pisac are excellent jumping off points for other journeys in Peru. After you register we will send you a detailed logistics document with maps, basic Spanish phrases to help you get around, and details on where to stay in Cusco and Pisac. We’ll also be in contact with you directly about your travel plans. We’re here to support you! We can't wait to journey into our hearts together!